It is coming up to 11pm as I write this and Christmas Eve is basically done and dusted. Heather is already in bed, as are Grandma, Grandpa and Uncle Pete, who arrived from London late afternoon bearing the turkey for tomorrow and other festive goodies. Which just leaves me with my random thoughts for company. 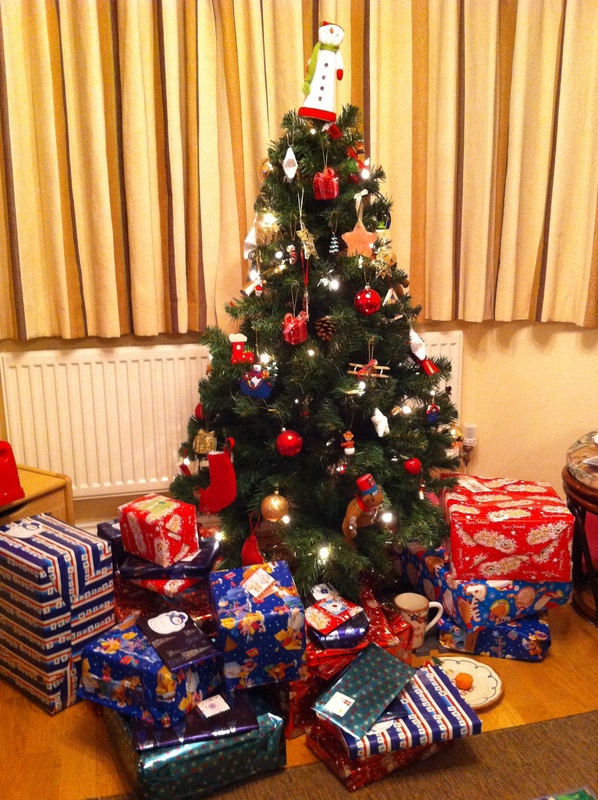 The tree is fully adorned, and all the presents – 852 for the boys, a couple for the rest of us – are arranged underneath it. This year, being the first when Zac (aged three) has really understood what Christmas is all about, we have also put down a drink, carrot and biscuits (Zac insisted on those rather than a mince pie) for Santa and his reindeer. I have even carefully nibbled and left teeth-marks on the carrot. I will be telling him in the morning that it was Donder – I’m determined that our boy will move beyond Rudolph, Dasher, Dancer and Vixen to learn the names of all eight reindeer. Next year, I will have to select a different reindeer – I’m thinking Comet – and leave slightly different teeth-marks. Yes, I’m aware I’ve been thinking about this way too much. In the same way that I don’t really see how the whole Santa coming down the chimney thing is even remotely credible when (a) we don’t have a chimney and (b) surely he’s going to get caught for breaking and entering – or at the very least trespass, or parking on a double yellow rooftop – eventually. Anyhow, before I lay my weary head to rest – that’s a line from Carry On My Wayward Son, isn’t it? – let me share a couple of random observations with you. Firstly, aren’t Facebook and Twitter wonderful for sharing festive messages? I have seen “Merry Christmas” updates posted by at least 100 people today. A handful of those people I will see over the Christmas period, several others we will at least have exchanged cards or other written messages with, but many fall outside those social circles – ex-colleagues I have fallen out of touch with, distant friends in faraway places, those who I only know online – with whom I would otherwise have had no contact at all. Whether broadcast or targeted, each seasonal greeting is heartfelt and gratefully reciprocated – and at times like this the world seems a much friendlier and more connected place as a result. I like that. Secondly, if you haven’t seen it yet, you must catch the NORAD Santa Tracker website. It’s a brilliant little resource which captures the current location of Santa as he executes his long and arduous flight plan tonight, delivering Christmas presents and joy to children everywhere, including ‘Santa Cam’ videos of his sleigh passing over famous landmarks such as the Taj Mahal. I have kept an eye on his progress over the course of the day as he has passed through Uzbekistan and Iran and then via the International Space Station over the Middle East and central and eastern Europe. Right now – that being 11.15pm UK time – NORAD is tracking him over Monte Carlo, with his next stop being Andorra, and with the UK to follow within the hour. In which case, I suppose I’d better get myself to bed pronto before he gets here. Either that, or I will have to stay up and smack him over the head with a shovel as he attempts to pick the lock on the front door of our chimney-less house. Well, an Englishman’s home is his castle – and I have the right to defend mine against unsolicited intruders, don’t I? I’m just joking, of course. I’ll be using a sawn-off shotgun instead of a shovel. Posted in Journal and tagged Christmas, Father Christmas, Santa, Santa Claus. Bookmark the permalink.